Worlds most powerful 17" mobile workstation, featuring Intel® processors, PremierColor UHD display and up to 4TB of storage. High-powered processors: We know you take on the biggest tasks. So we offer the best processors available. The Precision 7720 mobile Workstation delivers no-holds-barred processing power with the blazing performance of 7th Generation Intel ® Core i5, i7 and Intel® Xeon® processors. High-performance graphics: Next generation professional-grade 2xRadeon Pro WX and 4xNVIDIA Quadro® graphics options with up to 16GB of graphics memory. Super high-speed 2400Mhz and 2667MHz of DDR4 memory keep pace with demanding 3D rendering and other graphics-intensive tasks. Supports 8k display: Dell Precision 7520 and 7720 mobile workstations are the first with DisplayPort 1.4, which supports 8K resolution and HDR via a single cable? 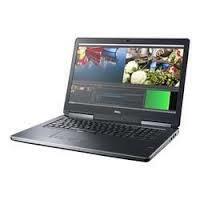 The manufacturers describe these laptops as mobile workstations – the Dell Precision 17 7710 range offers power, memory and superb display from an easily transported package. When it comes to productivity, the range is fully equipped for whatever software, game or programme that you throw at it. The series boasts incredible sixth generation Intel CoreÂ i5 and i7 processors, and the worlds first Intel Xeon options for any task – perfect for work, play and everything in between. Elsewhere, the superb Dell Precision Optimizer automatically adjusts your system settings to get the most from a given application or programme – letting you sit back and enjoy it, rather than tinkering with the controls. The brilliantly responsive AMD FirePro and NVIDIA Quadro graphics, with up to 4GB of GDDR5 memory, ensure that your device can cope with any task, whether an expansive game, 3D rendering software or anything else you decide to run. Meanwhile, your visuals are taken care of with a 4K Ultra HD display, boasting over eight million pixels on its 17″ screen – allowing you easy collaboration and satisfying streaming. The device runs the user-friendly Windows 10 Pro, for an even smoother experience. While all of this is going on, your computer benefits from a ultra light 3.42kg weight, a durable design, tested against MIL-STD 810G standards, that will serve you well on your commute, on holiday or wherever else you’re taking it. While it’s running, an advanced ventilation system to ensure that, whatever you’re doing, your Dell Precision laptop can cope. With ten ports and slots, it’s easy to customise your setup with extra Dell monitors, printers and speakers at home, before grabbing the laptop and heading out to work elsewhere. to talk you through your options. Our extensive stock is continuously updated with new products, so give us a call today on 03333 222 200 if you can’t see what you want.